Dog, Ghost, or Ball of Fur? One day our veterinary technician Nakiya decided that her dog Keeda was overdue for a good grooming. Keeda weighed in at 5 pounds before the brushing and weighed in at 4 pounds after the brushing. 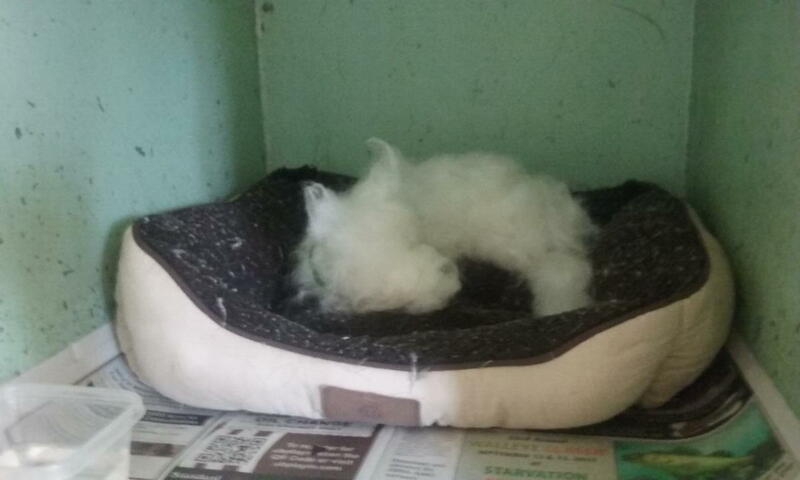 For fun, we decided to take the nearly pound of fur and "transform" it into the shape of a small white dog that was resting and leave it in a bed in one of the smaller back kennels. We were hopeful that we would get someone to fall for the dog shaped hairball and it turns out we had many people taking a double look.